← 60 Watts of Lazzor Power! A no-rules miniature car building and racing competition inspired by the Cub Scouts’ Pinewood Derby. 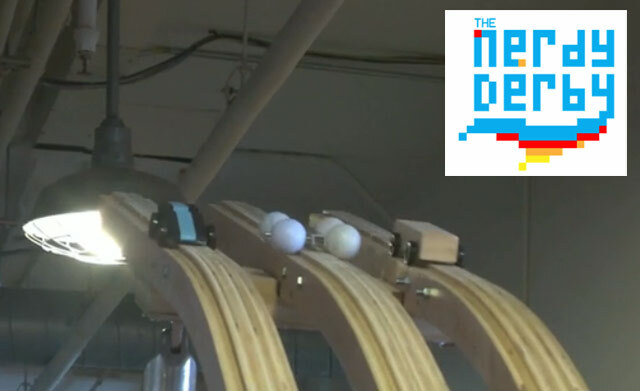 With a larger, more undulating track and no restrictions on the size of the cars or materials participants can use, the Nerdy Derby rewards creativity, cleverness and ingenuity. We thought this looked like fun and decided to get in on the act and hold our own Nerdy Derby right here in Milwaukee. 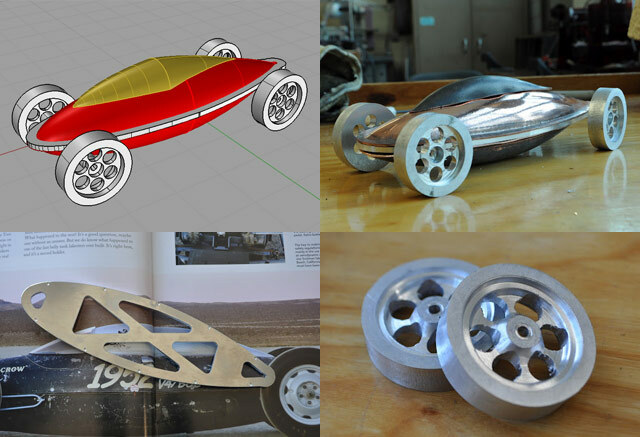 There’s been a bunch of talk around the space about car design, melting lead, putting the new lathes to work making wheels, and of course, laser cutting cars. 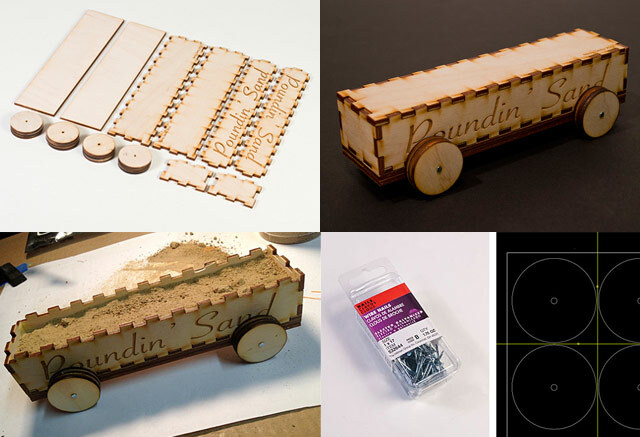 I’ve actually finished my first car, which has a body make entirely of laser cut Baltic Birch plywood, and is filled with sand for weight, which I call “Poundin’ Sand”. We’ve also got interest from people outside the space, in the greater maker community in Milwaukee. Here’s the amazing progress of Frankie Flood, who is building a replica of a “belly tanker” for his car. There are other cars in progress, and lots of ideas being thrown around the Makerspace about what people are planning to build, so it’s just a matter of time before we start careening down the track. Speaking of the track, we’ve got a regulation Cub Scout track so far, which we may try to modify to match the “official” Nerdy Derby track before the big race. And when is this “big race” you ask? Well, we’ll probably do a good test race at the space this month, and then if all goes well, we will have the big race at Bucketworks on Saturday night, October 6th, 2012 during BarCampMilwaukee. And we want you to join us! All you have to do is build a car, and show up. I know we said “no-rules” but we do have two semi-rules: don’t damage the track,and don’t make anything so dangerous it could easily injure someone. Besides that though…. anything goes! Don’t have all the parts you need to build a car? We’ll do our best to provide some parts at the race so you can make one on the spot. This entry was posted in car and tagged barcamp, cars, nerdyderby, race. Bookmark the permalink.